I have been a free-lance illustrator since 1987, but my passion, for the work has developed since chilhood, thanks to the range of wonderfully illustrated books I received and the variety of pencils, brushes and colors to wich I was exposed from early age. Until 1995 I worked in Milan in an associate studio of graphic-advertising professionals (Studio Giallo) and in 1996 I moved to Vanzago where I live and work actually. 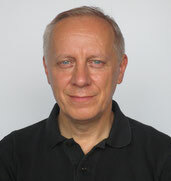 I was born in Bologna, but I have always lived in Milan, I did the scientific high school and the university of letters and philosophy but I did not finish family problems, for the same reason I started working as a technical designer at Honeywell, where I have acquired valuable professional skills. Meanwhile, I was studying at the Castle school (institute for the arts applied to industry) and I took lessons from a professional painter (Professor Mantica). When finally the fever for the illustration has reached an unsustainable level I have had to throw myself away and since then I have started to do the job I love and that I will always love. Technical illustration, exploded, assembly sequences, illustration, commercial illustration, hyperrealist illustration, promotional illustration, advertising illustration, illustration for packaging, illustration food, editorial illustration, image creation and processing, photo editing, hyperrealistic illustration products, visual, design - mascot ideation , drawing - designing characters, drawing - designing posters, drawing for manuals and instruction booklets, sections, sections, perspective drawing, axonometric drawing, graphics, logo design. TECHNIQUE present and gone (future, we do not know). Photoshop, 3dsmax studio, Painter, Illustrator, Corel Draw. Airbrush with acrylic colors, Ecoline-watercolor, overlay screens, china with brush nib and rapidograph,, Oil pastels, illustration with medium acrylic spray, painting with watercolor / Ecoline, pencils, scrapeboard, adhesive meshes, black and white illustration, drawing with stretch, black and white drawing.